If you're into the likes of The Magic Gang and Spring King you should love these chaps, Liverpool indie rockers Sugarmen who have recently released Push Button Age, a fast paced and punchy single, sure to get live audiences up and dancing. Following a successful few years taking their tunes to the likes of Seoul, SXSW, Reading & Leeds and further around the globe, they are set to release their debut album Local Freaks on 6th October. Following support slots with The Jesus and Mary Chain in Liverpool and Sheffield in September, the four-piece headline Sebright Arms in London for their album launch on 5th October - tickets here! Follow Sugarmen online - Facebook | Twitter | Instagram. Oxford's Low Island are by far one of my favourite new bands of the moment, with the incredible tracks That Kind Of Love and Holding It Down under their belts. In the run up to some live shows across the country they're releasing a new seven track EP, kicking it off with The Lines, a track as energetic and punchy as we've come to expect from the band - an instant dance floor filler. They've followed it up recently with the second tune from the EP, the comparatively gentle but equally (if not more so) beautiful Tomorrow. Carlos from the band has performed a live session of the track in a 1930s Art Deco music hall for the wonderful people of the Mahogany Sessions, and it's making me incredibly jealous of those who caught their stripped back set at Sofar Sounds Oxford for Amnesty International last week! Check out their upcoming tour dates here - including two nights at London's Corsica Studios in November. I posted about them just a couple of weeks ago but couldn't resist sharing this beautiful session from MarthaGunn, one of my fave new bands of the moment. They've been busy in the studio over Summer and took a break from a recording session to perform their tune Honest for The Crypt Sessions, a lovely stripped back version where Abi's vocals take the forefront. In love with these guys and reckon you should be too - keep an eye on their Facebook for future show announcements and new tunes! One of the best tunes I've heard in a while, taken from an upcoming album I'm pretty excited for, here's the video for DO IT from Rae Morris. About the video, Rae wrote on Facebook that she "had such an incredible time making this video with Noel Paul in NYC. coney island, baseball, helicopter rides & karaoke... genuine fun with amazing people." That's a pretty accurate summary - the only things to add are that if you like ice cream and dogs the video is probably for you! DO IT is from Rae's upcoming second album (release date yet to be confirmed), the follow up to 2015's stunning release Unguarded. Rae tours this month to preview tunes from the album, heading to Norwich, Nottingham, Salisbury and Leeds before finishing up in London at Islington Assembly Hall on 28th. Grab the last few tickets for the shows here! One of the best things about running this blog is the huge wave of emails I get daily, introducing me to new tunes from artists of all kinds of genres and from various places around the world. Today we head to Vancouver, Canada with brothers Ulysses and Zane Coppard, aka alt-pop duo Smash Boom Pow (who doesn't love a bit of onomatopoeia?!) Way Too Much is the first single from their upcoming EP, a track that vocalist Ulysses came up with to "clear some heavy vibes from his atmosphere", with the refrain "you're asking way too much of me" referring to "unfair emotional demands and the psychic damage they can inflict", particularly when it comes to a relationship. Get listening below and follow Smash Boom Pow online - Twitter | Facebook | Instagram. I've been a little bit in love with Banfi since catching them live for the first time back in November at their residency of free gigs at Old Blue Last and upon meeting the guys for the first time supporting Bear's Den in Oxford back in March. In the relatively short amount of time that has passed since those shows, things have been going incredibly well for the band - as well as touring the UK and Europe with Bear's Den and no doubt gaining countless fans in the process, they've been busy recording, releasing some cracking new music and playing many brilliant festivals. One of the first of those was Communion's Bushstock at the start of Summer, the last time I caught them live before this week, when I caught the London date of their first headline tour. Opening up the night was Bryde, with Joe explaining that the band had seen her performing at a festival this Summer and asked her along to support on the tour, and she said yes! With a drummer and bassist in tow she delivered an impressive set, commandeering the crowd into near silence from the first notes! Spiralling between loud, punchy tracks and slower, sadder numbers, the set flowed by quickly - a sign of a brilliant support act (with the other end of the spectrum being never-ending tracks when you're waiting for the headliner!) Check out a live video of the tune Less below, which I've added to the CMAT playlist this week - check that out on Spotify here! Once Bryde finished up it wasn't long before Banfi took to the stage, by which point the room was totally packed out. Selling out a show is always a huge achievement and never to be snuffed at, and on stage it was clear how surprised the band were that so many had decided to spend their evening listening to their beautiful tunes! With the crowd singing back the refrains of Happy When You Go and Rosedale House you could feel the happiness radiating from the guys, writing of the show after that it was "absolutely MENTAL ... If you saw us at any point after you probably noticed us beaming from ear to ear. Big up yourselves for making that our greatest show to date!" A highlight for all has to be their latest single June, for which they shared the music video on Friday, once again directed by the über talented Jake Dypka, and which is a totally beautiful piece - get watching below! Check out the record We're Not Going Anywhere on Spotify now! With a North American tour this month, PSB head back to play UK tour in October, with shows in Cardiff, Norwich, Manchester, Newcastle, Glasgow, Leeds, Coventry, Nottingham, Bristol, Portsmouth, Bexhill and London's Hammersmith Apollo - full dates including a 20-date European tour in November on the band's site here. Digging this tune from my inbox from post-electronic dance band Park Hotel who launched the track with a sold out single launch show at The Lexington back in June. Centring around the duo Tim Abbey and Rebeca Marcos-Roca, the band explore "the mirrorball-noir territory between alternative arena electronica and wired downtown songwriting", resulting in a funky tune and this glorious music video, a collaboration with artist Henry. Henry joins them as support act this Thursday when they headline The Pickle Factory in London (14th September - tickets here) - as a live outfit they expand into a six piece with three way vocal harmonies, two guitars, drums, percussion and keyboards - check out a live video here and keep an ear to the ground for new tunes if you're digging this as much as I am! Noah Gundersen has shared the first single from his upcoming record White Noise, released through Cooking Vinyl on 22nd September. Heavier than his previous tunes, the track is a bold move for the Seattle-based musician and quite the earworm! Writing about the record on Facebook, Noah wrote that "work began last spring. I called my then manager and told him I didn’t want to go on tour in the fall. I told him I wanted to make a record. Something different. Something that was going to take some time. I started writing songs. Lots of songs. Every day. The songs were like buildings, with scaffolding and framing. Things added, things taken away. Like oil paintings, waiting for colors to dry so that the next layer could be applied." Keep an eye out for Noah's third studio album on 22nd September - he's popping over to the UK for a couple of shows next week with London's Borderline on 11th and Manchester's Night & Day Café on the 12th! Tickets here! Benjamin Clementine has released Jupiter, the latest single to be taken from his upcoming record I Tell A Fly, the follow up to his Mercury Prize winning record of 2015. This new track was inspired by a U.S visa issued to Benjamin, where he was described as "alien" - shocking in an age of supposed equality. About the track and the experience, Benjamin writes that "here I was thinking I was living in a safe place, but nothing was really safe any more, or ever. It’s a poke at people being called aliens by some people, like we’re from another planet. I think we’re all forever aliens." The record was written, recorded and produced by Clementine himself in Damon Albarn's Studio 13 (following his Gorillaz collaboration earlier in the year), and is set for release on 15th September - pre-order it here! Benjamin Clementine heads out on a UK tour later in the year, taking in Brighton, Birmingham, Leeds, Manchester, Gateshead and Bristol, as well as a O2 Academy Brixton show on 5th December - tickets for those and his other European dates all here! I'm honoured to premiere the stunning video for new track Bells from Pêtr Aleksänder, a band consisting of Tom Hobden (Noah & The Whale, Mumford & Sons) and Eliot James (producer of debut NATW and Two Door Cinema Club records). The band combine strings, piano and electronic elements to make instrumental music, with wonderful results. Following the instant addition of their debut piece Sans Souci to Spotify playlist 'The Most Beautiful Songs In The World', they released Bells last week. Writing of the track, they explain that it is a "study in tension and release; a stability, centred around the piano, is tested but never compromised by beautiful but haunting string lines." Pêtr Aleksänder play their debut show supporting Susanne Sundfør on 2nd October at Union Chapel, going on to play in Glasgow at CCA (3rd Oct), Manchester at Deaf Institute (4th Oct) and Dublin at Sugar Club (7th Oct) - tickets here! The London date is sold out already, so be sure to follow the band online to keep up to date on future shows! Follow Pêtr Aleksänder - Twitter | Facebook | Soundcloud | Instagram. Some super exciting Oxford gig news emerged yesterday - my pals and total legends Catgod will be supporting Flyte on their show at The Cellar alongside another brill local band 31hours. Being back at home after graduating from university in Oxford the thing I miss most is the music scene, and gigs like this make me desperate to return - it really isn't one to miss, even on a school night! If you're new to Flyte, taking a listen of their beautiful recent debut album should be enough to convince you how great a gig it'll be. Need more convincing?! Listen to this stunning Alvvays cover from the Flyte chaps. As well as the headliners being superb, Catgod are going from strength to strength following the release of their latest EP Someone Love with festival performances aplenty and their own headline show at the same venue back in July. Check out the total tune I'm Innocent below! 31hours released their Rockpools EP last year and they're hard at work fundraising to release their debut album physically - check out the campaign here and listen to Royal Box below! Get along to the show and turn up early to support local, homegrown talent! Register your interest and grab tickets through the show's Facebook Event here. London five piece FAERS have released a tune inspired by their childhood heroes The Maccabees (it even opens with "no kind words"!) Last Of Our Kind was written during a songwriting retreat to the Welsh countryside, and has been labelled "a shimmering example of the bold and brazen songwriting that inspires youngsters to pick up guitars and form bands in the first place". It's an anthem that is hugely atmospheric and a positive sign of things to come for the band, who since forming in 2015 have already sold out various shows in London and Brighton, supported the likes of JAWS and The Cribs and appeared at Y Not and Camden Rocks festivals, as well as receiving radio support from John Kennedy at Radio X and Gary Crowley on BBC Introducing. FAERS headline at Camden Assembly in London on Saturday (9th Sep) with support from Electric Child House and BOYS - more info here! 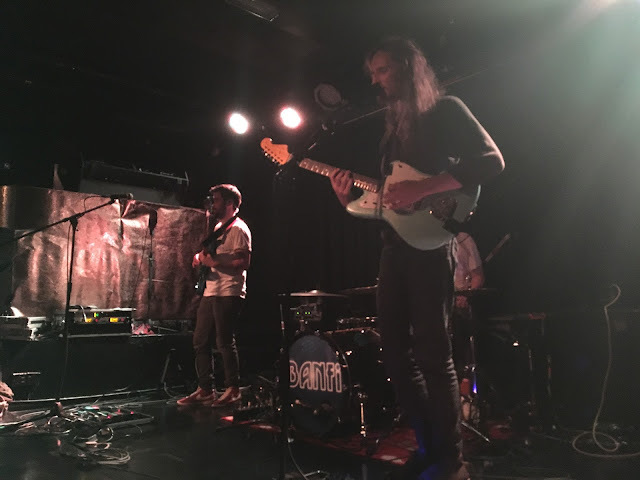 One of my favourite discoveries of the past couple of years and a highlight of my time at The Great Escape back in May, MarthaGunn have shared a live video from their time playing a bunch of shows in Europe! From a support slot with AnnenMayKantereit in Vienna, here they are performing Hell For Leather... if you like what you're hearing be sure to check out Honey, Let Me Know, another total corker, and the cover of Earth, Wind and Fire's September they performed with AnnenMayKantereit earlier in the year - it's got over 700k views! The band being back in the UK hopefully means that they'll be back in the studio making more of their beautiful music for us, and if you're based down South you can catch them live in Brighton supporting Flyte at Patterns (dream line-up) on 16th September! It's been two weeks since Manchester's Everything Everything graced us with their fourth studio record A Fever Dream, earning themselves an early shout for my favourite record of the year. They scored an incredible number five in the album charts and a tour of instore gigs at record stores around the country helped to earn the chaps the top spot in the Official Record Store Chart - these achievements are exactly what they deserve for releasing such an exquisite record! Check out the title track being performed live earlier in the year here... a favourite of mine from the album! I was lucky to catch them play to the tiny but totally rammed Rough Trade Nottingham last Tuesday, just a couple of days after the record was released. 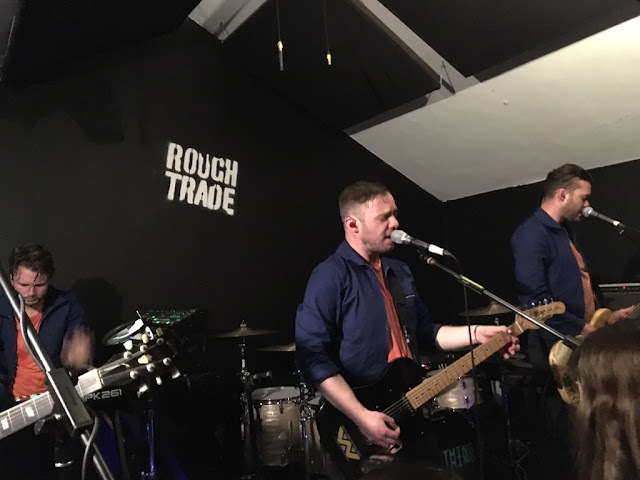 The sweltering heat of the store's upstairs venue space and extortionate central Notts car park prices were both worth enduring for the set, with the band playing a few tunes from the new record and following them up with live favourite Distant Past. I've seen them live before a few times and wondered whether the smaller venue and the fact that the crowd wouldn't all be familiar with the new tunes might change the vibe, but the band gave as much energy as to the crowds at their huge slots at Reading and Leeds last weekend (special shout to their keys player Peter Sené who always gives 110% on stage and is a joy to watch!) The set started with the album's opening track Night of the Long Knives which I can see becoming a live favourite very quickly and which built up the momentum and volume for the rest of the set, with singles Desire and Can't Do featuring alongside the total powerhouse Ivory Tower and another of my favourite tracks Run The Numbers. All in all it was a total joy to watch the guys playing again and even more wonderful to meet them briefly at the signing afterwards and to tell them how great they are and how much I adore the record! If you'd like to catch Everything Everything play tracks from the brilliant new record A Fever Dream, be sure to grab tickets to their biggest UK and Ireland tour to date in March. It'll see them play in Dublin, Norwich, Birmingham, Bristol, Leeds and Glasgow, ending on a hometown show at O2 Apollo in Manchester and a mammoth London show at Alexandra Palace. Grab your tickets from the band's website, general sale started today!